The sudden demise of DMK chief and the five-term chief minister of Tamil Nadu, Karunanidhi, on 7th August has shocked the entire nation. His followers and other DMK workers are on the roads and the entire state is mourning today. Before entering politics, he worked as a screenwriter in the Tamil cinema. Later on, he also wrote several poems, plays and novels and contributed to the Tamil literature to a larger extent. Therefore, he was often referred to as Kalaignar, which translates to "an artist" in Tamil. Apart from heading the South Indian political scene and reframing its structure, he also did a lot of social work for the betterment of the society. Hence, it is no wonder people are crying their hearts out after his death. He was also one of the few politicians who promoted Tamil Nadu tourism on a great scale. There were places which were unknown to national tourists back in the 20th century, but today, they have become popular tourist destinations. How about learning about these beautiful places which found their place in every tourist's heart? Read on to know more about how they flourished over a period of time. Also known as Mahabalipuram, Mamallapuram is a port city in Tamil Nadu and is famous all across the world on account of the presence of UNESCO World Heritage Site within its boundaries. Do you know this historic city was once famous only amongst locals and a few offbeat travellers? Today, Mahabalipuram has marked its presence of the global map of the tourism industry and is visited by tourists from all over the world. 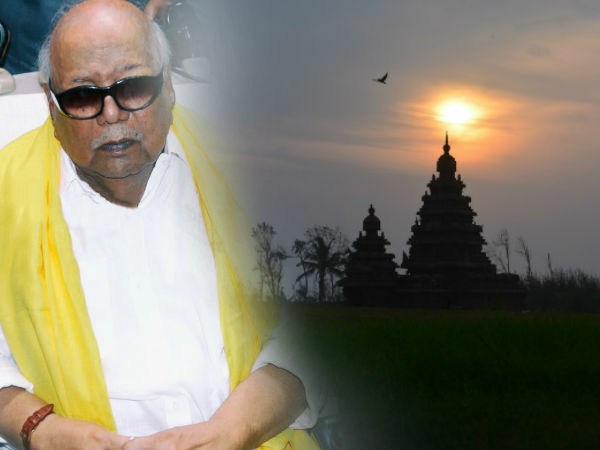 Thanks to Karunanidhi who asked the tourism department to promote its age-old monuments. On account of its promotion, the sculpture industry of this ancient city flourished rapidly. Mahabalipuram is located at a distance of about 55 km from Chennai and is easily accessible. Today, Madurai is one of the most visited places in India and is known as the Athens of the East. Do you really think it had the same reputation back in the 1960s and 1970s? Certainly not. The beauty of Madurai which has been captured by tourists from all over the world was popularised after the tourism department of Tamil worked hard under the leadership of Karunanidhi. Madurai is located at a distance of about 460 km from Chennai and is immensely popular for its beautiful temples and mesmerising monuments. The world-popular Meenakshi Amman Temple is located on the banks of Vaigai river in Madurai only. Who knew about the majestic beauty and the royalty of Thirumalai Nayakkar Palace before it was promoted by the tourism department? Affectionately known as Trichy, this beautiful town, which has become popular amongst national tourists on account of its age-old divine temples and other centuries-old historical monuments, was once a town with zero tourism from other states. It was only popular within the boundaries of Tamil Nadu. However, today, it is visited by millions of tourists from all over the country every year. From temples to forts, churches to river ghats, there is a lot to witness here. It is one of the few popular places in the state where you can actually learn about the raw culture of Tamil Nadu. So, who wouldn't love to explore this beautiful city? The major places to visit here include Rockfort Temple, Sri Ranganathaswamy Temple, Srirangam Island and Jambukeshwara Temple. Fort, churches, temples, hills, park, paragliding spots, camping sites, trekking trails and what not - you can find everything within the boundaries of Vellore today. Located at a distance of about 140 km from Chennai, Vellore is a popular tourist destination and is frequented by travellers, Hindu devotees, history lovers, photographers and architecture enthusiasts. After all, where else in Tamil Nadu can you find such an amazing place which meets every tourist's demands? Another heritage city which has been in existence for thousands of years, Kanchipuram is famous for its silk sarees. Even though it has always been a popular destination amongst Hindu devotees and was considered as one of the holiest places in India, it was popularised amongst common tourists by the tourism department of Tamil Nadu under the direction of Karunanidhi. The major places to visit here include Kailasanathar Temple, Ekambareswarar Temple and Thiruvekka Temple. What do you think of a visit to this millennium-old city and exploring its marvels?